At Puppet, we've been looking at the state of DevOps practices for several years and helping organizations achieve higher levels of efficiency. 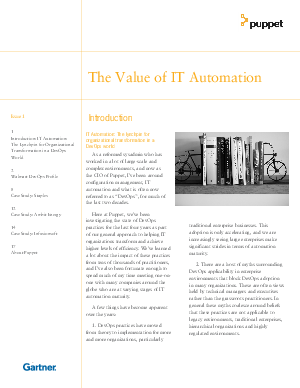 We’ve learned a lot about the impact of DevOps at varying stages of IT automation maturity. As DevOps has moved from theory to implementation for more organizations, a host of DevOps myths have blocked adoption in many organizations. This publication debunks these myths so your organization can automate, innovate, and get ahead. Why DevOps is applicable to legacy environments, traditional enterprises and hierarchical organizations. Practices that underpin DevOps, from version control to automated testing to infrastructure as code. How companies like Walmart, Staples, Ambit Energy and Infusionsoft have embraced DevOps and IT automation.